Great care has been paid to the design and the manufacturing process of our unique feeding bottles..
Our philosophy: no concessions made regarding any aspect of our feeding bottles: impeccable from conception until the day of recycling. Our products are 100% made in France which guarantees not only their quality but also traceability. The teat is the key to a comfortable and pleasant feed. Thanks to the quality and technical specifications of our design, your baby will happily accept bottle feeding. The texture of the teat, its flow rate which is adaptable for each age, its ergonomic shape and especially the presence of an anti-colic valve are all combined parameters which ensure that your baby will effortlessly latch on to our bottle. 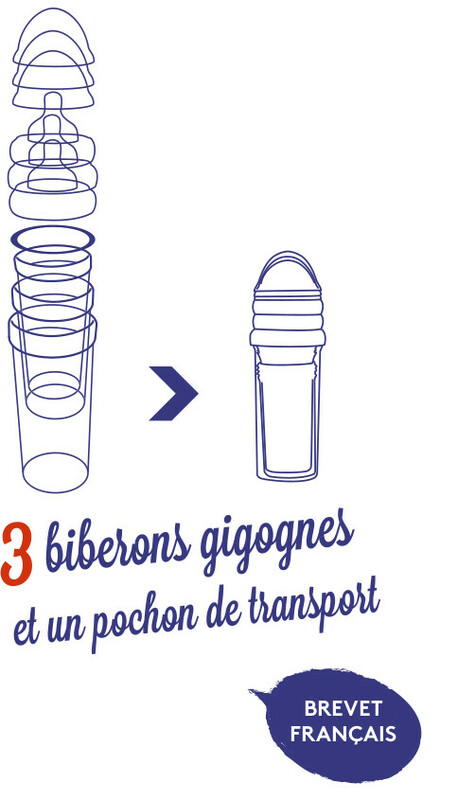 Because of its shape and texture, Le Biberon Français offers you an ideal teat to supplement, or replace, breastfeeding. HOW DOES THE ANTI-COLIC SYSTEM WORK? When your baby drinks a bottle and empties it, depression is created in the bottle and this counters the sucking action. The more your baby drinks, the greater the vacuum becomes and suction gets more difficult. Thus, your baby will need to recover between sucking and will take large puffs of air that can cause colic. Apart from the risk of colic, if the pleasure of sucking becomes an effort some babies may refuse to drink. 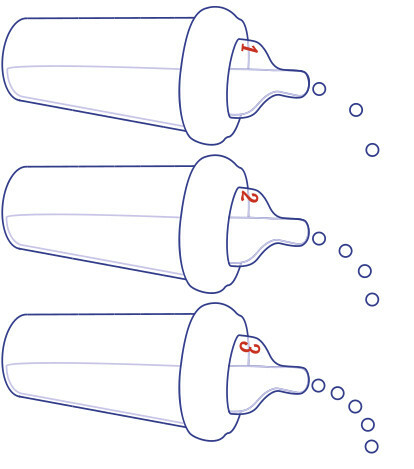 An anti-colic valve allows air to be returned to the bottle and facilitate suction (the small bubbles rising to the surface of the liquid are indicators of air intake). The shape of the teat's slit has been specifically designed to allow different flow rates depending on the orientation of the teat. When the number 1 is facing upwards, the flow will be slow. If you see the 2 on top, the flow will be average, and the flow is fastest when the number 3 is in view. So all you have to do is turn our bottle to get the flow required.